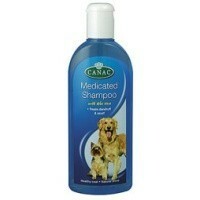 Canac Medicated Dog Shampoo 250ml is a specially formulated shampoo that has been enriched with Aloe Vera. Suitable for all breeds, this non-irritant and anti-bacterial formula helps to control dandruff and scurf, as well as strengthening the roots of the coat to leave it strong and healthy. Freshen up your dog's skin and coat to leave it beautifully clean and glossy with this fantastic Canac Medicated Dog Shampoo!